77, Gangaur Ghat Marg, Udaipur - 313001 (Rajasthan) India. 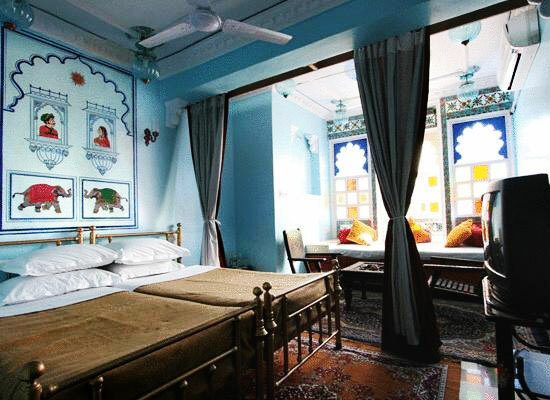 "Located on the Gangaur Ghat Road, quite close to the Lake Pichola, Anjani Hotel is one of the best heritage hotels in Udaipur, offering a pleasant stay to its guests, amid world-class conveniences. Savour lovely views of the hills and lakes, and refresh all your senses. The caretakers offer a royal treatment, taking you back in the days of yore. Enjoy impeccable hospitality services of the hotel staff. The 21 guest rooms are well-equipped, well-furnished and boast of a colorful cultural decor. The royal palace of Seth Naga Ji Kapoor Chand Shah was turned into a heritage hotel in the year 1990. The property has been named Anjnai, after the name of the mother of Lord Hanuman. A kund in the property was renovated and converted into a huge swimming pool. 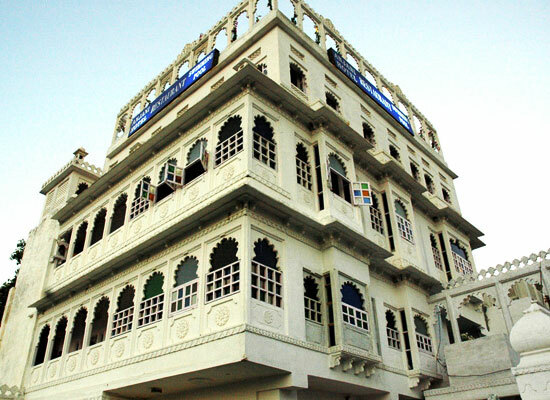 Accommodation at Anjani Hotel, one of the popular heritage hotels in Udaipur, comprise of well-furnished and well-equipped 21 spacious guest rooms that take their cue from Mewar as far as the interiors are concerned. The attached bathrooms are clean and come with all the modern toiletries. Some of the facilities and amenities include an air-conditioners, ceiling fan, telephone with intercom, Channel music, TV with satellite / cable connection, cassette players, hot and cold water round the clock and more. The décor of the guest rooms is colorful and interesting. 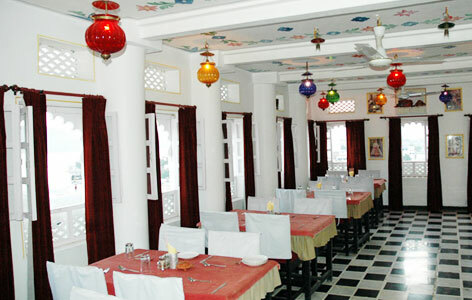 Anjani hotel in Udaipur has a roof top restaurant serving multi-cuisine delicacies of Indian, Chinese and Continental fares prepared by the expert chef and his team using aromatic spices and fresh ingredients. While enjoying your meals and classic music in the background, savor the stunning lake view. One of the most romantic destinations in India, Udaipur boasts of being one of the most popular destinations in the royal state of Rajasthani. 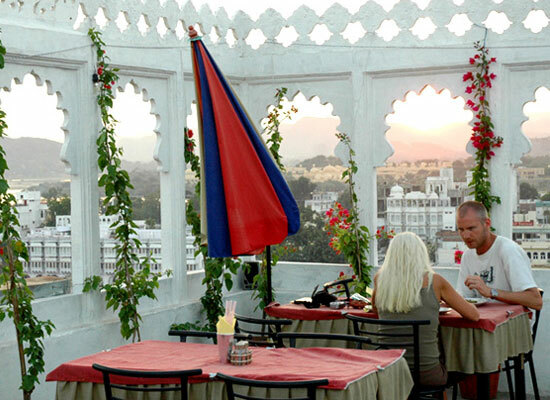 The lofty Aravali ranges and the placid waters of Lake Pichola make it even more charming. 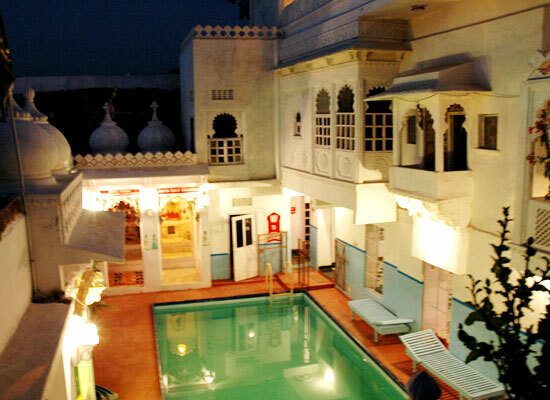 City Palace, Jag Mandir, Saheliyon ki Bari, Jagdish temple and Lake Palace are some of the famous Udaipur attractions.